186 pages | 7 B/W Illus. The Global Atlantic provides a concise, lively overview of the complex and diverse history of the greater Atlantic region from 1400 to 1900. During this period, the lands around the Atlantic basin – Europe, Africa, and the Americas – became deeply interconnected in networks of trade, cultural exchange, and geopolitics that reshaped these regions and the world beyond. In this accessible and engaging text, Christoph Strobel integrates the Atlantic into world history, showing that the Atlantic oceanic system was always interlinked with the rest of globe. From the Mediterranean origins of slave-worked sugar plantations to the Chinese demand for silver from American mines, The Global Atlantic discusses key examples of these connections with clarity, enabling students to understand how existing ideas and incentives shaped the emerging Global Atlantic, and how these Atlantic systems in turn created the world we live in today. "…through its enjoyable narrative, this book provides a comprehensive and useful overview on the global currents of the Atlantic world." "What Christoph Strobel offers in The Global Atlantic is the most concise and readable cure for any ‘Atlanticentrism’ that might be ailing you. Follow his lead, and you’ll discover a truly global ‘New World,’ one that embraces all of the planet’s oceans and continents." "The Global Atlantic offers a fresh look at the Atlantic World that should excite both scholars and students. This innovative book integrates the complexities of the Atlantic World into a rich mosaic of global interactions and connections. 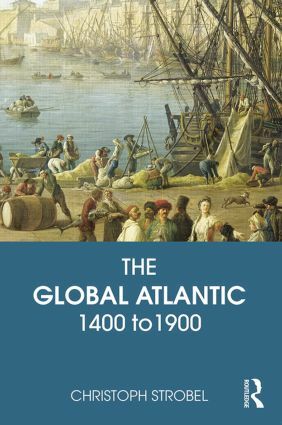 The Global Atlantic has an accessible style and offers a masterful view of global intersections that shaped and were in turn influenced by the Atlantic World. It is a must for either undergraduate or graduate world history courses." "He pays more attention to the intercontinental role of Africa than most authors have previously done, noting that Africa was an active participant as well as a passive recipient in transoceanic economic and cultural encounters. As a quick summary, the book will be useful for teachers of world history and possibly also for students as collateral reading for survey courses. A valuable bibliography shows the author’s careful attention to the most recent interpretations. Summing Up: Recommended. All levels/libraries." acting to shape the early modern world." 3. The Global Atlantic and the "Spanish Sea"
Christoph Strobel is Associate Professor of History at the University of Massachusetts Lowell. He is the author of The Testing Grounds of Modern Empire, and co-author, with Alice Nash, of Daily Life of Native Americans from Post-Columbian through Nineteenth-Century America.